Finally, after dropping several little recommendations in previous issues of Wizard (issues 16, 17, and 24 in case you’re keeping tabs at home), I wrote a full-length “Palmer’s Picks” about Bone. 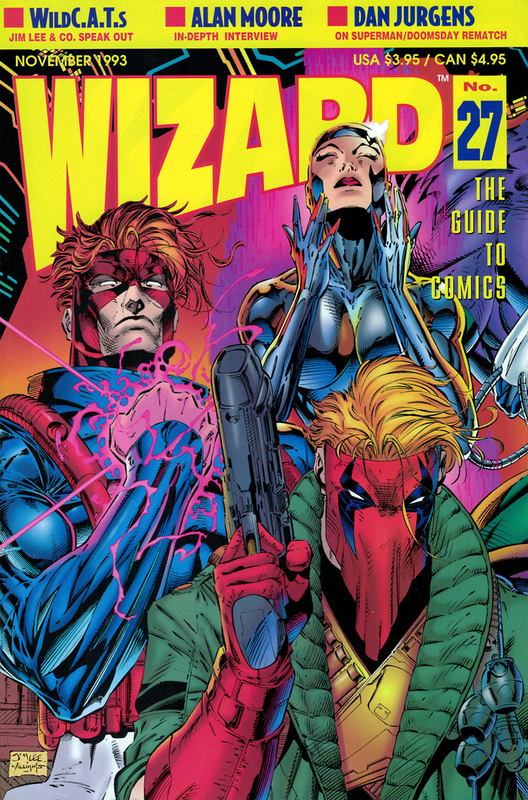 Jim Lee returns for another Wizard cover for issue 27, bringing along his WildCATS characters. After acquiring Jeff Smith‘s phone number from Starchild creator James Owen (as detailed in my last post), I embarked on my second phone interview. This time I was armed with a recording device to make sure I got all the facts right, and to free myself from having to take notes while trying to hold a conversation with a stranger on the phone. These two interviews with Owen and Smith were conducted at home while I was on summer break from college. Dorm life and a packed course schedule would make it difficult to conduct phone interviews, so the practice stopped when I went back to school in August. Jeff Smith was another easy and fun interview. Just as Bone was a welcome change of pace from the darker-edged comics of the early ’90s, speaking to Smith was a refreshing experience due to the fact that he was a creator who was not steeped in the worn-out influences of every other cartoonist. Even though this was only my second interview, it was nice to get some unexpected answers when I asked cookie-cutter questions like “who are some artists you admire?” or “what comics did you read growing up?” This was also one of Smith’s early interviews, so a lot of the information I learned was new; nowadays Smith’s earlier career as an animator and love of Walt Kelly’s Pogo are both widely-known facts. I still have the tape from the interview packed away in a box somewhere. (Don’t even bother asking me to put it up online. I hate the sound of my own voice!) I don’t recall too many details from it, but I do remember getting a good laugh out of Smith when I jokingly asked if Fone Bone and Thorn would ever hook up. I hope he was laughing at the joke instead of wondering what kind of dullard was on the other end of the phone. 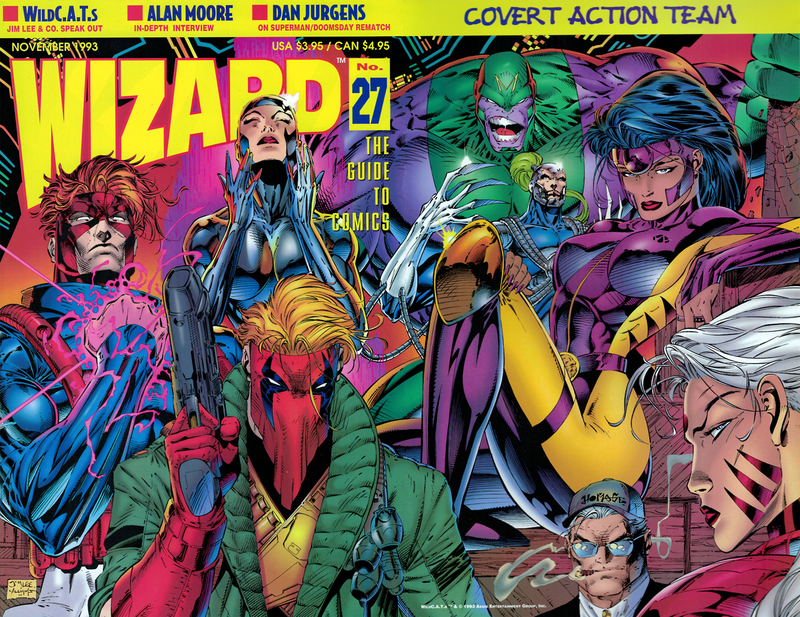 Jim Lee’s full gatefold art for his cover of Wizard #27. You get a prize if you can name all of the characters without consulting Wikipedia. By the time this “Palmer’s Picks” saw print, Bone was already garnering a lot of attention, and it only got bigger as time went on. Bone became that rare comic that could really transcend the imaginary barriers between the mainstream and the independents. If you were a fan who only bought superhero books, Bone would probably be that one indy comic on your buy-pile. And Smith’s astounding cartooning abilities meant that he couldn’t be ignored by the sometimes cliquish underground. Once the comic market started to nosedive in the late ’90s and things got more difficult for self-publishers, Smith sought refuge at Image Comics. He eventually returned to self-publishing and finally wrapped up Bone in 2004. Unless you’ve been completely out of touch, you know that Bone continues to be a phenomenon thanks to the full-color Scholastic editions that helped bring Smith’s creation—and comics as an artform—to a whole new generation. It’s interesting to note the development of the trade paperback plan for Bone. At the time of this interview, with less than a dozen issues complete, Smith intended to keep individual issues of the series in print until they were collected as six-issue chunks in volumes of The Complete Bone Adventures. Eventually, this idea was abandoned in favor of a series of graphic novels à la Neil Gaiman’s Sandman. The first Bone Adventures was repackaged as Out From Boneville, the second volume became The Great Cow Race, and the third was retitled Eyes of the Storm. With these graphic novel reprints, Smith also made small changes to the comics, and even redrew some sequences. The individual issues of the comic almost became a first draft for what would be the enduring format for Bone, the graphic novel. I think these early experiments with interviewing my “Palmer’s Picks” subjects really helped improve the quality of the writing, even though I didn’t use any direct quotes. It’s a shame I didn’t do more of them at this early stage of the column. For the next “Palmer’s Picks” covering Colleen Doran’s A Distant Soil, it was back to the old method of researching and writing. But there were even bigger problems awaiting me, as you’ll learn in my next blog post. Very rarely does an artistically well-developed and flat-out excellent comic appear virtually out of nowhere like Jeff Smith’s Bone. In the short span of two years, Smith has gone from being a complete newcomer to the comic book field to being one of the most respected and talked-about comic artists in the business. If all of this sounds like pretty weighty claims for just a little self-published black and white book, then you obviously haven’t picked up a copy of Bone yet. The premise of Bone is simple enough to allow new readers to easily jump aboard without being bogged down in confusing plotlines and complex characters. The story is centered in a Lord of the Rings-inspired fantasy world invaded by cartoon characters that go by the names Fone Bone, Phoney Bone, and Smiley Bone. They are cousins, each with their own individual traits and personalities. Fone is the good-natured innocent of the group, Phoney is constantly thinking of new schemes to make himself rich and famous, and Smiley is the dopey cigar-smoking dullard of the three. After one of Phoney’s plots went bad, they were run out of their home, Boneville, to find themselves lost in a valley populated by a host of comical, terrifying, and fantastic creatures. The plot of the book revolves around the series of adventures that the Bone cousins find themselves in while stuck in the valley. These are merely the surface of the larger story, which is rooted in the fantasy elements of the series. It concerns the invasion of the valley by the Rat Creatures, led by Kingdok and the Hooded One, and their mysterious connection to Phoney Bone. Smith claims that Bone is an open-ended series, but it will have a definite ending. The conclusion of the series is already written, but Smith will not end the story until he gets to at least four or five definite adventures he has planned out. The story is loosely structured, so that Smith can add situations for the cousins to get into without jeopardizing his plans for the series. Maybe one of the reasons that Bone is so fresh and exciting is that Smith is not a product of the “inbreeding” that many other creators fall victim to. He only avidly read comic books as a child for a short period in the late ’60s, and only returned to the industry a few years ago. By being far away from all of the changes and trends that have passed over the industry in the past two decades, Smith has brought a new perspective to comic books by combining elements of both animated cartoons and classic newspaper comic strips. Some of Smith’s favorite comic artists appeared only in newspaper strips, and never actually worked in comic books. One of the most obvious influences on Bone is Walt Kelly’s Pogo, one of the greatest comic strips ever published. With Bone, Smith has crafted a cast of unforgettable and instantly likable characters in much the same way as Kelly did. Smith also uses a very simple panel design and layout in much the same way as Charles Schultz does with his Peanuts comic strip. He also draws from more current comic strips, with the occasional oddball gag inspired by Gary Larson’s Far Side and the subtle expressions and gestures of Garry Trudeau’s Doonesbury. Bone actually began as a daily newspaper strip in Smith’s college paper at Ohio University, in Athens, Ohio. It was called Thorn then, but it featured the same characters and situations as the comic book. Smith’s strip eventually caught the eye of some of the major newspaper syndicates, like King Features and Tribune Media Services. However, their deals didn’t appeal to Smith, since he wanted to retain ownership and full control of his characters. Instead, he went on to form an animation studio, Character Builders Inc., with a group of friends. The company started out mostly doing commercials, but it later went on to get jobs from larger studios (the company is currently working on the new Betty Boop movie). Smith eventually sold his part of Character Builders to start Cartoon Books and publish Bone in the summer of 1991. Smith says that he has been drawing the Bone cousins since he was a small child as a way to imitate his favorite cartoon characters. It’s obvious that he has been doodling these characters for a lifetime, since he is able to evoke an amazing range of expressions and gestures from them with just a few deceptively simple brush strokes. Smith is also equally adept at rendering lush landscapes and backgrounds, imaginative fantasy characters, and truly horrifying evil creatures. He combines all of these elements seamlessly to make a truly engrossing and fluid reading experience. If you don’t want to take my word that Bone is a great comic, than you can listen to some more well-known fans as Stan Sakai, Dave Sim, Gerhard, Diana Schutz, Charles Vess, Matt Wagner, Chuck Dixon, Kim Deitch, Jim Valentino, Scott McCloud, and Will Eisner. Hopefully these should be enough reasons to jump on the Bone bandwagon before it’s too late. All you have to do is pick up one issue, and I promise that you will be hooked for good. Next month: I’ll continue my look at self-publishers with a feature on Sandman artist Colleen Doran’s A Distant Soil. As usual, I’m still open to feedback, so keep your letters coming. Send them to Palmer’s Picks, c/o Wizard Press, 100 Red Schoolhouse Road, Bldg. B-1, Chestnut Ridge, N.Y. 10977. Tom Palmer, Jr. is a freelance writer based in New Jersey who wonders what happens to all of those socks that get lost in the laundry. Bone is published bi-monthly by Jeff Smith’s Cartoon Books. All issues are in black and while with full-color airbrushed covers. Ten issues should be out as you read this, all of which should be in print in some form or another (the first issue is already in its fifth printing). Individual issues are available for $2.95 postpaid, and subscriptions are $18 for one year and $36 for two years. The Cartoon Books address is P.O. Box 1583, Los Gatos, Calif. 95031-1583. The first six issues of Bone have been collected as The Complete Bone Adventures Book 1. The book includes an introduction by Will Eisner, and four new pages that fit within the story of the comic. The pages are reproduced on heavy white paper, and the book costs $12.95 (plus $1.50 for shipping), $5 less than the cover price of the original comics. Smith plans to publish a collection of Bone Adventures every year so that his story will be able to stay in print. For all of the die-hard Bone fans out there, there is a limited edition Bone print available. Titled “The Spirit of Adventure,” it features a black and white image of the Bone cousins at the start of their exile from Boneville, with images from their adventures over them. The 17″ by 11 3/4″ drawing is reproduced on 2-ply Bristol board, and is limited to only 100 copies. It’s signed by Smith, and comes with a signed certificate of authenticity. The price is $100, and it can he ordered from Cartoon Books at the address above. There are a few items of Bone merchandise that are worth noting. Planet Studios has produced a T-shirt and a cloisonné pin of an image from Bone with Fone and Phoney in front of the comic’s logo. Both are in full color, and the shirt comes in medium, large and extra large. The pin is available for $6.95, and the shirt goes for $15.95. Don’t send your orders to Cartoon Books. These items are only available from Planet Studios, at P.O. Box 729, Chimaye, N.M. 87522. If you are interested in Walt Kelly’s work, then there are many books that you could track down. The easiest Pogo books for your local store to get are probably the Fantagraphics reprint series. These books reprint the entire newspaper strip series in chronological order. The first volume (which reprints the pre-syndication strips from the New York Star in 1948-49) is available now, and subsequent volumes will reprint approximately a year of the strip with an informative introduction by R.C. Harvey, a well-known comics historian. Each volume sells for $9.95 and can be ordered from Fantagraphics at 7563 Lake City Way NE, Seattle, Wash. 98115.